Finding emails often comes up as a request for more information during Smart Email Management workshops. Nothing is more frustrating than trying to find an email you know you received/sent but it’s not where you expected it to be. As you start to waste time so the stress levels rise too. Here are four easy ways to find that elusive email. Outlook starts with the inbox but there are several ways to search all your folders. 1. Click the hyperlink ‘Try searching again in All Mail Items’. If you are not good at keeping your inbox clean it is easy to overlook this link at the bottom of the initial inbox search. 2. Set the default to Search All Folders. Outlook defaults to the folder you have highlighted, usually the inbox. To make it automatically search all folders go to File/Options/Search and check the box marked All Folders. Then click OK. Now all your future searches should search all your mail folders. Clearly with a big inbox you might need to refine your search criteria. 3. Remove any search limits. 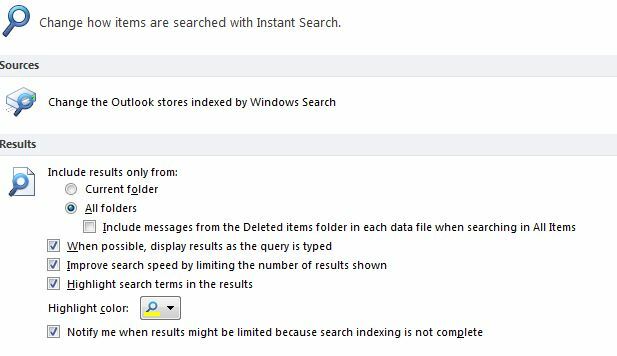 The default in Outlook is to ‘Improve search speeds by limiting the number of results shown’. The limit is about 250. If you have an enormous inbox you may need to override this setting. As As in (2), Go to File/Options/Search and uncheck the box marked ‘Improve search speeds by limiting the number of results shown’. 4. Use the Search Folders At the bottom of your Inbox is a set of ‘Search Folders’. There are a few pre-defined ones such as Larger Than 500 KB. However you can set up some personalised ones too and especially for those searches you do frequently eg from a key contact but whose emails might be filed in several folders. 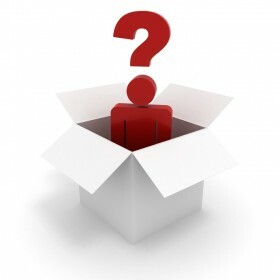 Right click on the Search Folders (folder) and use the Dialog Box which appears. Don’t forget, the bigger your inbox the harder and longer it might take to find that elusive email. If you just spend more than ten minutes searching for an important email, now might be the time to start seriously de-cluttering. All these tips assume all the emails you need are in your personal inbox. This is often not the case when they are project related. They may be scattered across several inbox and sets of public folders. In this case you need to look at using a dedicated email management application such as Mail Manager. 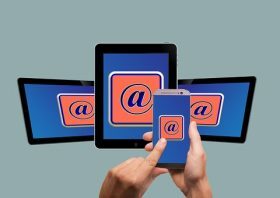 Is email the only way? Thinking outside the inbox. Is email the only way? 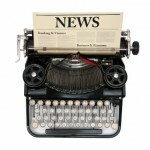 We now have an array of digital communications from social media to the phone. Last week a client complained at being emailed by another colleague who sat just five desk away. How often does this happen to you? We have a love hate relationship with email: its fast and easy but not always the best communications channel. An over dependence on email at the expense of other channels is one of the primary causes of email overload. Yet how many of us make the effort to think outside the inbox before hitting send. Very few judging by many of my client’s experiences. However, some leading organisations are being innovative and for example banning all internal emails and having no email days in an effort to both reduce email overload and improve communications. These range from high-tech companies to housing associations and architects. Others are setting boundaries outside which its OK to stop checking emails. My email behaviour will influence your behaviour here are three ways to encourage others to think outside the inbox. 1. Provide an incentive for them to talk to you. 2. Use an alternative tool to provide information which people really need, for example the form for requesting leave, a sales update, for example OneNote, a collaborative platform such as Slack or Yammer. 3. Implement email free times and email free office zones. To reduce the email dependency (and even email addiction) above all else make sure you create the role model: next time you are about to hit send, get up and walk and talk to the person. Try responding to external email with a phone call? You might be pleasantly surprised at the extra information you pick up to help progress that important sale. Indeed stopping checking emails is fast becoming the new stop smoking for some. Blue Monday and you business email overload is still rampant. Fifteen days into the new year how well are you keeping to your new year’s resolutions? Maybe like me you did not even set any because it’s about goals rather than resolutions. A resolution is permanent, it’s immediate with effect from now for example, you will not answer emails after 9.30 pm. It’s a way of life. It can be hard. Resolutions are good but sometimes things happen which make it hard to keep them. For example you are in the middle of major global business deal and need to check your emails late at night. With resolutions there is a feeling that you have now let yourself down. Indeed in a study psychologist Richard Wiseman found that 88% of people failed to achieve their resolutions. Whereas with goals they are more objective, specific, and long term provided they are smart. The arguments for reducing business email overload have been well rehearsed here before and should be part of your business values. Then you can establish some smaller measurable steps to achieve it. Over time you can review and measure how often you achieve your goals and take small steps to either adjust the goal to a more realistic one or achieve it. In this case it might be to re-set either the time scales for checking emails or the number of times per week to make it more realistic for your work-life pattern. You can reward yourself periodically as you achieve your goals – celebrate with a good bottle of wine. Conversely fine yourself for lack of achievement – none of your favourite coffee for a week. This does not mean you cannot have a resolution and goals. A resolution might be to re-balance my work-life balance to spend more time with the family. Within that you need a set of smart goals to help you achieve this new equilibrium. 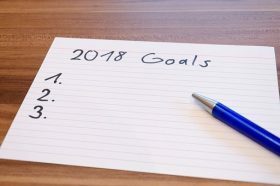 Wiseman suggest that one of the keys to keeping resolutions is to make them public and have a graphic posted in a prominent place to remind yourself and others of your aim. Social media makes it easy to spread the word. Identify what you need to achieve the goals. To restrict the times during which you check emails it might be using your email software better. For instance, a rule to notify you about emails from very high priority contacts whilst ignoring the rest and setting two types of Out of Office Message (one for internal and one for external emails). Based on the many workshops and webinars run over the last year here are seven goals for helping you and your business reduce email overload in 2018. Step away from email for at least one hour a day: use that hour to walk and talk to the senders. Apply the 80:20 rule to help prioritise what emails are really necessary (ie 20% of the emails received will provide 80% of the information need). Take action immediately after reading an email instead of glancing at it and leaving it lying fallow in the inbox. Use the 4Ds principle. Keep emails short which will help save everyone time (you the writer and the recipient when reading it). Only deal with emails between 8.30 am and 9.30 pm. This way you can allow yourself an occasional day’s relapse, yet still feel you have made progress. What are your goals for reducing email overload in 2018?